Carthage College is a four-year private liberal arts college with roots in the Lutheran tradition. Situated in Kenosha, Wisconsin, midway between Chicago, Illinois and Milwaukee, Wisconsin, the campus is an 80-acre arboretum on the shore of Lake Michigan. Carthage is home to 150 faculty scholars, 2,600 full-time students, and 400 part-time students. Carthage College needed something that would keep deposited students excited in the period after they stopped receiving admissions marketing, but before they started receiving incoming student communications. This lull in communications also coincides with the time where students are their most excited. They finally see the light at the end of the tunnel of their high school careers and they see college on the horizon. 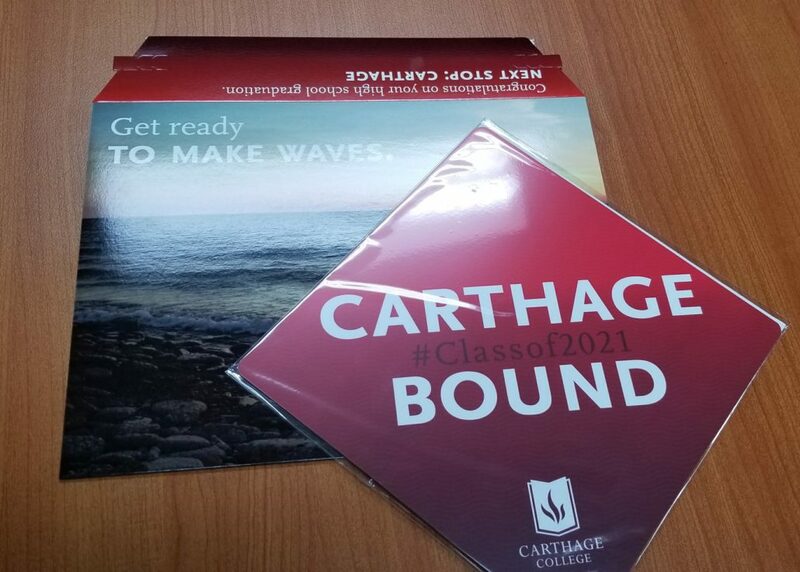 Before utilizing the Tassel Topper, Carthage’s admissions counselors would get invitations from deposited students to come to their high school graduation or to attend high school senior award ceremonies (with some sort of certificate in tow to recognize the student’s accomplishment). There was a demand from deposited students to incorporate Carthage into their high school graduation in any way possible. A graduation card from their admissions counselor wasn’t cutting it anymore. "A lot of times we were the only college that had Tassel Toppers at a high school graduation and it was amazing to see a red cap stand out in a sea of black ones." Carthage learned about the Tassel Topper from Magellan Promotions and thought it would be the perfect marketing solution for deposited students who were between the admissions and orientation processes. The Tassel Toppers were an immediate hit with students as evidenced by the flood of photos that started showing up on social media. Students weren’t the only group that loved the idea. The Tassel Toppers were such a hit that the admissions office started receiving calls from parents requesting more after their students received the Tassel Topper mailing. They wanted duplicates to frame and, to the surprise of the admissions office, to put onto graduation cakes. The Tassel Topper worked more than just to amplify excitement. 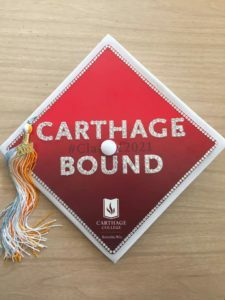 During Carthage’s first year using the Tassel Topper, attendance at orientation programs was up compared to the previous year and less deposited students chose to attend other schools compared to the previous year. Carthage also seamlessly switched to an online check-in for the first time and believes that the extra point of contact provided by the Tassel Topper helped with that. 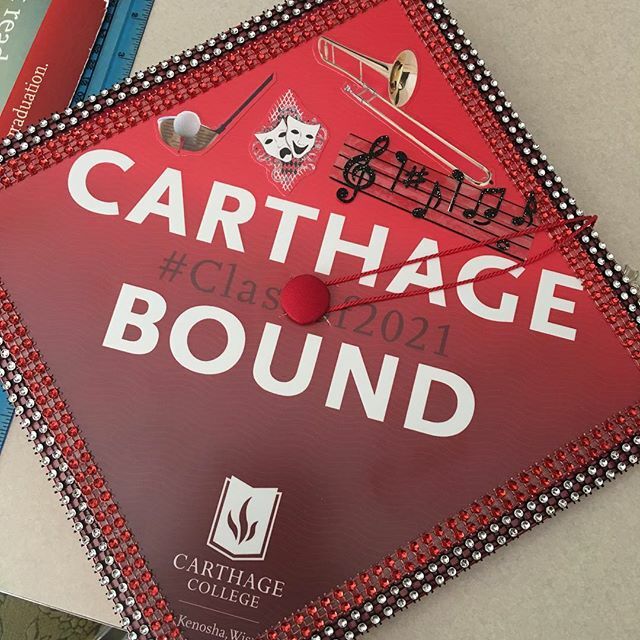 An incoming Carthage College student decided to go even further and decorated their Tassel Topper with stickers. Interested in the Tassel Topper? Want to excite your incoming students on their big day? Reach out to discuss the best Tassel Topper package for your incoming students today! Please contact your account manager, send us an email, give us a call at 414.831.0184, or fill out our contact form today!